How did you get into astronomy? My sappy story is: When I was a kid in suburban Philadelphia, my teacher Mrs. Miller took us on a field trip to the local university and they had a planetarium. I was just absolutely mesmerized by space and the stars and wanted to know anything about space. 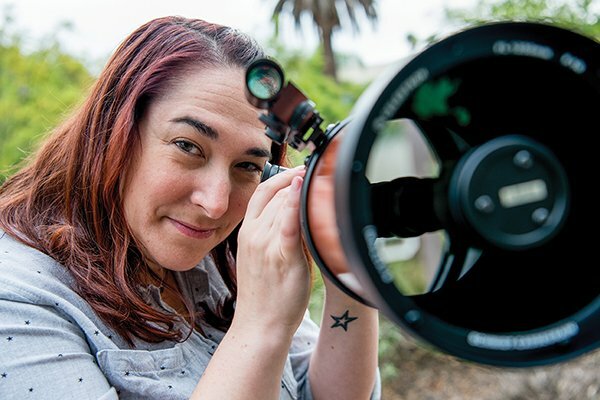 I came home that day and told my parents – I’m like 9 – I want to be an astronomer! and they were like, O-kay. I got my bachelor’s degree in the same public university, and the lab part of my first astronomy class took place in that planetarium. I also had two awesome high school teachers who made me realize that to really study space, you have to be a physicist. One was the only physics teacher I ever had who was a woman. What do you do now? I study the area around the most massive magnetic stars. We try to see how a star changes over its whole lifetime. When does it get its magnetic field? How does it change as it gets older? How does its magnetic field play into its evolution? One of the challenges with my stars, the very most massive stars, is that their lifetimes are very short. A star like that is going to live for a million years or three million years. That sounds like a lot of time, but it’s really not, cosmically speaking. So one of the things I would like to start to study is what happens to these most massive stars when they’re babies, when they’re still dynamically forming. By the time all this sorts itself out, and it’s finally like, Hello, I’m here, and it clears away all the gas, we’ve missed a really important part of its evolution. Why have we been missing that? Stars in star-forming regions are hard to observe. They’re hiding. One tool we use for looking into those places is infrared light. That’s a whole field of study now. With infrared, we can see through gas and dust into places like the galactic center where there are a lot more stars, or where the stars are a lot younger. How do you observe a magnetic field that far away? I study the material around the outer part of the star. For example, when you see those little loops in pictures of the sun, that’s a little bit of a magnetic field that’s come out. The sun actually produces its own magnetic field due to its different layers moving at different speeds. That field makes storms and outbursts and flares and sunspots and things like that. It’s very dynamic. How that magnetic field forms for my stars is very different. But once it’s formed, it’s stable, just like you stuck a bar magnet in the middle and left it alone. There will be some decay over time, but for the most part it just stays there. Why are they so different from the sun? Massive stars have a higher gravity, so the layers of gas are held together better and rotate at the same rate. You don’t get that difference in rotation rate that produces the sun’s magnetism. Until they found the first one in 1978, nobody actually figured that massive stars would have magnetic fields at all. Do they usually? Based on survey studies that some of my colleagues have done, if you gave me 10 massive stars, I would expect one of them to have a magnetic field – that we could measure. Remember that all of what we know about the interior of stars comes from studying how it affects the exterior. It’s complicated but it’s so cool. It is cool. Space, right? That’s why I took Russian in college. I was like, What if I become an astronaut and I have to speak to my Russian cosmonaut friends? It made sense to me at the time. Um, I’m claustrophobic. And I get motion sickness. Sally Ride is a personal hero of mine; she was really inspiring to me. Traveling to space, risking everything to try to explore the unknown – it’s an amazing idea. We’re so little and everything’s so far from us. On the first day of astronomy class, I show my students a picture of Earth from the moon. Do you feel small right now? Does that change your perspective about not running to class? And then I show them the Pale Blue Dot photo from Voyager. Seriously: insignificant. Tiny. But you feel connected to that bigger cosmos. You keep saying ‘my stars.’ We become very attached to stars. I’m part of a survey team, and if you’ve done a lot of work on a particular star, people will talk about Mary’s star or Mark’s star. What’s your star? My star is Sigma Orionis E. It’s in the Orion constellation, in the sword. It’s the first massive star discovered to have a magnetic field, and I worked in my thesis on making a new analysis of that. We came up with a new map of what the magnetic field looks like and it’s really beautiful. Is it bright too? That one’s not so bright, but it’s my baby.